Have you ever thought about how de-humanizing it is to be defined by a single, negative characteristic of your life? It’s a fact of life for individuals and families when they experience homelessness. Suddenly, that person isn’t “me” any more. Anyone who them in their circumstance would see only “the homeless,” and perhaps give them a wide berth or even cross the street to avoid them, eyes averted. If they’re noticed at all. The rhetoric in Santa Cruz is getting more and more dismissive of people who are homeless as worth less than the rest of us, and useless to the community in every way. You hear it on the streets, and all over social media. “They” are everything “we” are not. Lazy. Shiftless. Thieves. They are not mothers, fathers, sons, daughters, grandparents, grandchildren. They are not artists, engineers, college graduates. They are outsiders. They are not us, so they don’t matter. The members of the Downtown Streets Team are shattering those stereotypes every day. Their bright yellow shirts make them stand out as they provide general clean-up of the streets and beaches in Santa Cruz, and assisting in providing services to the community when volunteering with other organizations to make Santa Cruz and happier, safer place to live. Their smiles and can-do attitudes and behaviors are helping open doors with local landlords and businesses who are becoming more and more willing to take a chance on renting to and hiring people experiencing homelessness in Santa Cruz. Community members are seeing friendly, contributing behaviors instead of the disruptive behaviors of panhandling, stealing, and criminal violence that they’ve been told over and over again is the only thing to expect from “the homeless.” The negative messages bombarding us on social media and through conversations and rhetoric from many local political and business leaders are being countered by the evidence of our own eyes. I’ve been spending some time with the Downtown Streets Team over the past few weeks, and recently I sat down with Greg Pensinger, Project Manager in the Santa Cruz office of the DST to learn more about the positive impact the DST is having on not just those experiencing homelessness in Santa Cruz, but the community as a whole. Bay Area Non-Profit News: As we begin, is there a specific, ongoing issue that is not being resolved that you want to highlight today? Greg Pensinger: There is a severe shortage of both temporary and permanent housing not only in Santa Cruz but across the West Coast. In California we do a poor job of providing adequate shelter; in Santa Cruz, for instance, only about 20% of the people experiencing homelessness have access to shelter. What this means is that there is a lot of so-called “visible homelessness,” meaning people sleeping in their cars, encampments, or on sidewalks. I think people in general – again not singling out Santa Cruzans – are at their wit’s end when they see this issue getting more prevalent right before their eyes, and as a result we hear a lot of negative rhetoric surrounding the issue. In short, we need to change the conversation around homelessness if we’re ever going to move toward actual solutions that move people off the streets and into sustainable living situations. BANPN: As you know, I spent a morning with Dora’s team a couple of weeks ago cleaning up in the Coral Street/Pogonnip area. As she picked up cans, bottles, paper, cigarette butts, and more, we had a chance to talk quite a bit. Here’s something she shared with me that illustrates that growing negative rhetoric, which translates to knee-jerk behaviors. I’m paraphrasing, and sharing with her permission. Dora, who’s lived in Santa Cruz for more than 30 years, and has been struggling with homelessness for a several years now, told me of walking with some friends downtown one day. An average looking, friendly, middle-aged Hispanic woman, she wasn’t dressed in any particular way, but was carrying a full backpack – for many in Santa Cruz, a neon sign that flashes “homeless approaching.” As she was moving forward, a mother with a couple of children noticed her, slowed, gathered her children with a wary look in her eyes, and quickly hustled them to the other side of the street. She’d encountered this behavior before, and wasn’t surprised, but became curious and decided to test something out. She took her backpack off and handed it to her friends and asked them to hold back a bit to observe while she walked on ahead with a confident stride. Others walking toward her began smiling and nodding, and another mother and her child made eye contact, smiled and said hello, and continued on down the street. And all she’d done wa simply removed the tell-tale backpack; she was exactly the same person as before. BANPN: After attending your weekly Thursday lunch meeting, I was blown away by the number of services and activities you provide, both for and with your team members! 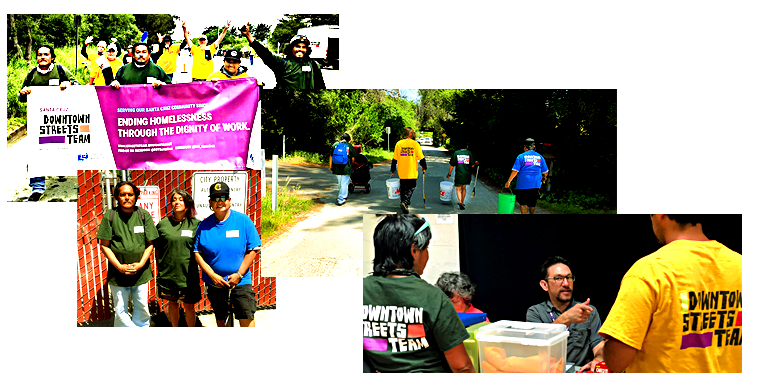 From the daily downtown and river walk cleanups and community support activities by team members, to the Blue Tarp Project and the Ebb & Flow Arts Festival, to assisting with job searches and navigating the complexities of government assistance programs, you seem to have all the bases covered. For example, some of your team members were a part of the Coastal Watershed Counsel’s Snap-Shot Day on May 5th. Tell us about that. GP: Very early on – when we were just starting out in Palo Alto in 2005 – we heard from our Team Members that the hardest part about being homeless was the feeling of being invisible and marginalized. Providing a platform for our Team Members to participate in and reintegrate into the community has been one of our guiding principles ever since. Participating in events like The Human Race, the Holiday Parade, Ebb & Flow, and Snapshot Day as well as looking for opportunities for our Team Members to speak about their experience of being homeless in Santa Cruz, helps to bridge the gap between “us and them” and moves the needle toward really changing the conversation. We also recognized that some of the barriers to someone’s finding employment, let’s say, are things that we sometimes take for granted: access to a computer, for instance. So we’ve really tried to remove these barriers. As we speak, a Team Members is completing his Serve-Safe Training using my colleague’s computer in our office. If we open our doors and our resources to people and provide a welcoming environment, great things can happen. BANPN: I spoke with a team member last week. She asked that I not use video or share her name, so I’ll call her Jane, but she was eager to talk to me about her experience with DST, and how it changed how she thought about herself and gave her new confidence. I asked her to talk about how the DST has impacted her personally. BANPN: I’m here with a member of the Downtown Streets Team. You’re a team leader? BANPN: How long have you been with the Downtown Streets Team? JANE: It’s been since last summer, I’ll say last July. BANPN: And so, besides being a Team Leader that goes out every … and you go out every day, right, five days a week? BANPN: About four hours a day? BANPN: And what do you like about that? Jane: I like it that I’m in the same community that I’ve lived in for well over 30 years, it’s about 36 years now that I’ve lived here in the county. However, the difference is that everything that we do draws me into the public Monday through Friday. Now I’m taking Friday’s off, but Monday through Thursday. That’s a different way that I didn’t really expect when I got into this. I mean, I’ve lived here a really long time, but my habits are different from when I was not working with DST. BANPN: And how did your habits changes? Jane: Seeing people every day, especially being on Pacific Avenue every day in one manner or another every day, instead of staying away from town when there are more people there. That was true for me for a long time. BANPN: So you’re not as shy as you used to be. Jane: (laughing) No, no. It was just more of a practice than being shy, I didn’t like being on the Avenue, I didn’t like the tourists, especially. And I always knew the less busy times to go anywhere. So everything has turned around. BANPN: Is that because you’re having input in the community and making a difference in the community? Jane: Hmmmm… In part, yes, I would say. I have some input in a different sense than I did before. BANPN: And what would you say to other people who are homeless now? Jane: It’s up to us to let situations and other people define us, or to BE the people who define us, I think. BANPN: So learning to define yourself instead of accepting others’ definition has been an important change for you as a result of your experience with DST. Jane: Yes. Everyone has their little different opinion about how the individuality makes a difference, but it’s something I can say it meant for me. BANPN: You also assist team members with navigating the complex application processes for accessing services such as HUD’s Housing Choice Voucher Program. I know that process, and others, can be daunting and time-consuming. How does that support work? GP: Though we are not officially a housing organization – meaning we do not have direct access to subsidies and we do not administer a housing program – our Team Members are homeless and are in need of housing. You’re right that the process is sometimes overwhelming for someone who may or may not have access to their vital records, a mailing address, a phone, or a computer. In addition to helping to navigate the process, simply helping them remove some of these barriers is a significant step. We are participating in the County’s recently launched SmartPath Coordinated Entry System, which is designed to prioritize housing and other resources for those who are the most vulnerable on our streets. This system promises to make the process of finding housing more efficient and less confusing, so we’re happy to play a role. GP: This is not a brick and mortar service, but a collaboration of local businesses that we are currently trying to put together. The idea is to be able to provide someone who has confirmed an interview with a shower, a haircut, and a set of interview clothes. We already have a stylist at L’Atelier on board and are putting together our career closet. We’ll be doing outreach soon to try to find a local gym who might be willing to schedule showers for our job seekers. BANPN: You recently participated in the annual Human Race. How did that go? GP: The Human Race was incredible! Our Team Members really enjoy doing stuff like that and just being able to let loose a little bit. They even came up with a DST chant: “When I say ‘Downtown’ you say ‘Streets Team’” They got a lot of positive feedback from community members along the route and came out of it really energized. BANPN: Greg, thank you so much for your time. Before we wrap this up, how can people in the local community get involved with the Downtown Streets Team in a meaningful way to contribute to the positive outcomes we all want to see continuing to happen? GP: We really want our volunteer opportunities to bring the community together around the issue of homelessness and provide an opportunity both for our Team Members and other community members to be able to interact with and learn from each other. Some of our opportunities include Apply-a-Thons, in which community volunteers work one-on-one with Team Members to complete online employment applications; our Hygiene Kit Assembly events, in which a community group will hold a drive for materials (shampoo, toothbrushes, etc) and then meet with our Team Members to assemble these vital outreach resources; and we’re working on environmental cleanup days as well, in which community members can work alongside Team Members to beautify the community. The easiest thing to do is support our Team Members when you see them out there by just simply saying “Hi” or Thank You.” It means a lot for them to hear it. The other day, I heard of someone throwing their trash at a Team Member out of their car window and telling them to pick it up. Please don’t do that. It saddened me to hear this and tells me that we really do have a long way to go in terms of bringing the community together around this issue. BANPN: Where can we currently see your teams working around Santa Cruz? BANPN: Greg, thank you for taking this time with me. We’ll be eagerly following DST’s progress in Santa Cruz through our Facebook, Twitter, and Instagram feeds. If you’d like to learn more, or be a part of making a difference in the lives of those experiencing homelessness in Santa Cruz, and the in the community at large, click here to read more at their web site, or email santacruz @ streetsteam.org. And hey, when you’re out and about in Santa Cruz and you see those bright yellow team shirts, give them a wave for your car, or say, Hi!” as you’re walking by. You’ll all feel better for it!